Typewriters Center Stage Writers Block video is our blog post focus today. If you have ever had to sit and contemplate what to write, then this four minute video will have you smiling. When I wrote my first daily blog post here 448 days ago I had one Olivetti Lettera 22 Manual Typewriter tucked away to call my own. Then there was the addition of Dad’s Typewriter – an Olympia SM5 Typewriter which arrived from Mom last May, and now fast forward my total number of typewriters has grown to six. This is how it begins – word is out that I love typewriters! I’m hesitant to think what the number is going to be at this time next year as I suspect the number will grow exponentially. 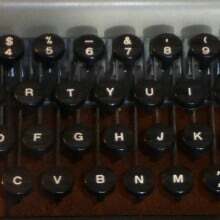 Last year in my June 23, 2015 blog post Celebrating International Typewriter Day it included a link to The Typosphere web site where I first learned of the planned day. It also included sharing about Richard Polt’s upcoming book at the time The Typewriter Revolution: A Typist’s Companion for the 21st Century. It is a delight to report it is a wonderful book and will be sharing in a future blog post here very soon. On The Typosphere web site from less than two weeks ago, May 5th, there is a blog post “Writer’s Block Or… “A bunch of actors getting in the way of a nicely lit typewriter shot”. It includes a fantastic four minute Vimeo video created by Ben Watts & Ivan Kander. This Friday, May 20th, 2016 will by my 450th daily blog post here at AnchoredScraps.com and coming up with ideas every day to write about had me smiling while watching this video! Here’s to a wonderful day ahead and a shout out to my fellow Typewriter Enthusiasts! Image above upper left by Helen Rittersporn close up of her Olivetti Lettera 22 Typewriter taken February 14, 2015.